Marie Graber runs the Arbor House Country Inn in Jamesport, Missouri. You might remember Marie from last month’s post on Amish life in winter. Marie was raised Amish, and was a member of an Amish church for some time. Today Marie answers questions on the Jamesport Amish community, tourism in the area, growing up Amish, and other topics. I hope you enjoy this interview. Thanks to Marie for her answers, and to Don Burke for photos. Before we get started, one note: For those of you who entered the drawing for Mark Louden’s book Pennsylvania Dutch: The Story of an American Language, we have a winner, here. And if you didn’t win, you can order at an Amazon-beating discount here. 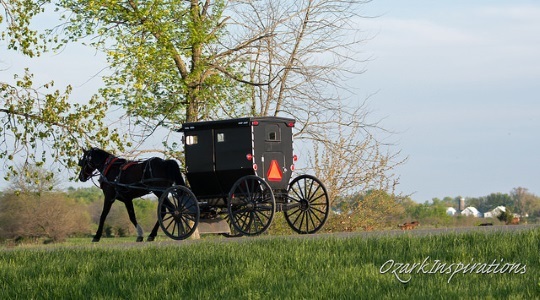 Amish America: Can you tell us a little about yourself, what is your background? Marie Graber: I was born and raised Amish. My life began in a small town in Holmes County Ohio called Trail. My dad was raised in Ohio and my mom was from Missouri. When I was 10 years old my family moved to Jamesport, MO. It was a big change for us! We went from having 2 acres of land to 63 acres! I was a tomboy so I mostly spent my days following my 4 brothers around, helping them with mowing hay or whatever it was they were doing. I come from a family of 9 children and there was never a dull moment. We didn’t have electricity or internet so as children we made up our own games to play and spent lots of time outside. In the summer we went swimming or horseback riding for fun when we weren’t working. I was 22 years old when I made the decision to join the Amish church. I left the Amish a few years ago for different reasons. I am now a member of a Mennonite church. Yes I did get shunned, but I am allowed to go see my family. I have other family members that are no longer Amish as well, but do still have some that are Amish. We still get together as a family and sit down and visit. I don’t really have that much to do with the Amish aside from family. There are a few Amish in the community that won’t be friendly to me because I left, but for the most part if I meet up with them in public they are nice and friendly to me, and I appreciate that. Can you tell us about your Inn? How did you get into the business? Who are your guests? Marie: When I was 16, I started working part time for Ron and Gail Ledesma as a housekeeper for Arbor House Country Inn. A few years ago they decided they want to retire and move to California to be with their children. They asked me to move in their place and manage it for them, as they had been trying to sell it but couldn’t find a buyer. We had talked a bit about me buying it but I didn’t have enough money saved up for a down payment etc. One day Ron calls me and said they would finance me if I bought it, so we signed the papers on May 11, 2016. I was really nervous about all this but so far it’s been a really great experience! I have people from all over come here. I had guests from places like Norway and India. Most of my guests are tourists that are curious about the Amish culture. I enjoy meeting new people and hearing their stories. It’s a very interesting job! What can you tell us about the Jamesport Amish community? Marie: There are 8 Amish churches in Jamesport. I would guess there are around 100 families total. The Amish around here enjoy socializing and will get together with others for a meal in the evening. Sometimes they will have a softball or volleyball game going. 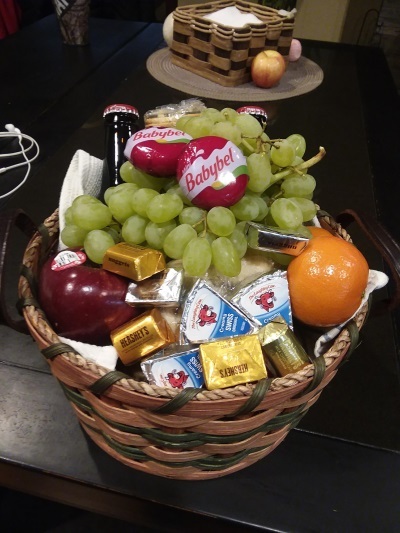 Families are fairly close-knit and will get together to celebrate birthdays or anniversaries. Amish do raise lots of their own food and can it for winter, but they will shop at Wal Mart and places like that. The closest Wal Mart is in Chillicothe, which is 30 minutes away. They will hire a driver to take them, as it is too far to go with a horse and buggy. If they go visit family or friends in other states, they will have a driver take them. I also get lots of Amish drivers stay here at the inn when they bring Amish to town for a wedding or funeral in the area. How would you describe the Amish tourist industry in the community? Is it well-developed? Does the area get a lot of Amish tourism? Marie: Yes, lots of people that visit Jamesport are here to learn more about the Amish. The JCA (Jamesport Community Association) does a great job in planning events to bring people to town. We have festivals here throughout the year that people enjoy attending. How involved are Amish in the tourist industry in the area? Marie: The Amish who own businesses are pretty involved. Mostly the Amish like to keep to themselves and live a quiet life. The people around here are friendly and open to talking to tourists if they have questions. Do your guests come specifically to visit the Amish, or are there other reasons? Marie: Most of my guests are tourists wanting to learn more about the Amish, but I do have some that come for antiques, or are visiting to buy fabric for quilts, etc. As I mentioned earlier, I also have Amish drivers stay here when they bring people to town. Why do you think non-Amish people are interested in the Amish? Marie: I think most people are so fascinated by the slower pace that the Amish live their lives, no electricity, no internet. 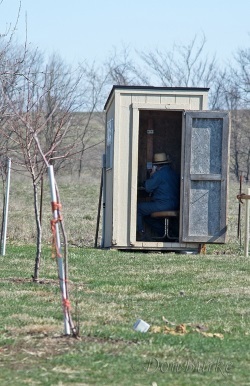 The Amish do have phones but they are kept in a small building on the property. They do not allow phones in the house. If you want to reach someone you call them and leave them a voicemail, and wait for them to call you back! There is nothing like texting someone and hearing back from them right away. I think it fascinates people that the Amish don’t have everything right at their fingertips the way most Americans do! The horses and buggies are a huge fascination as well. To go somewhere you can’t just hop in your vehicle and go. First you have to get your horse in and harness it up and that can take time, especially if your horse decides he doesn’t want to go anywhere, and makes you chase him around the pasture for 20 minutes before allowing you to catch him! Then after you get him hitched up, it takes longer to get to your destination as a horse is much slower than a vehicle! What are some of the biggest misconceptions about the Amish? Have you heard any funny questions or ideas about the Amish from visitors? Marie: Yes, I have been asked every goofy question in the book!! I do understand that people are curious and the only way to find out is to ask. Some of the most frequently asked questions are if the Amish are allowed to shop at Wal Mart or places like that? Are you allowed to use deodorant? And are the women allowed to use feminine hygiene products? The answer to all of these is yes. Most people come here with the misconception that the Amish are some kind of saints that don’t argue or ever fight with anyone! I always have to break it to them that the Amish are human beings just like you are! They have struggles and trials just like the rest of the world. As children my siblings and I fussed with each other just like any children do. We still don’t always see eye to eye on everything, but we always find a way to work out our differences and forgive each other. Some people think the Amish never do anything fun and that they just work, work, work. They do take time to go on family vacations together. Through the week they will get together for volleyball or softball games in the evening. What are some of the main attractions in the area? Marie: People really enjoy the slower pace of Jamesport! It’s a small town with a relaxed atmosphere. Lots of people enjoy the festivals we have throughout the year. One thing most people enjoy is taking a tour with Step Back In Time Tours. It’s a 2 to 3 hour deal where you get the chance to visit the Amish shops in the country surrounding Jamesport. My mom does house tours where she will take you into her house and show you how the propane lights, etc. work in an Amish house, and let you peek inside her buggy! People really enjoy seeing first hand how things work. 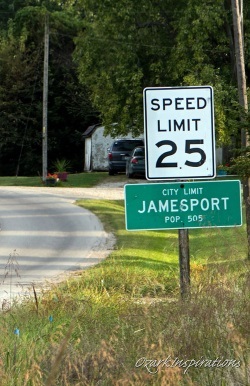 To learn more about Jamesport, visit jamesportmissouri.info for more information on the festivals, etc. 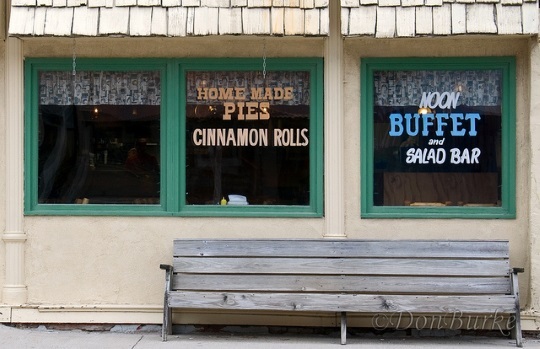 What Amish-owned businesses in the area could you tell us about? Any interesting ones to you, or ones that are popular with your guests? 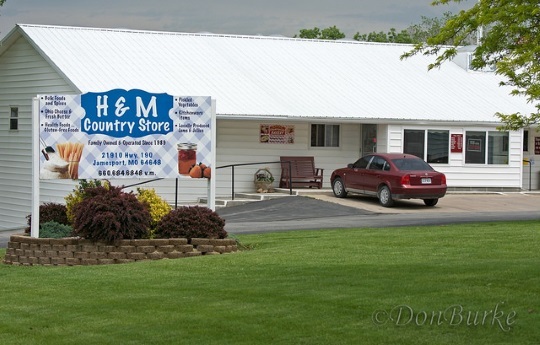 Marie: People enjoy visiting H & M Country Store. It’s a bulk foods store with a large variety to choose from. Also, the Countryside Bakery is in the same parking lot as H & M. You need to stop in and try some Jalapeno Cheese bread or some of their other varieties include Apple bread or Tomato basil bread. They also have lots of other baked goods! 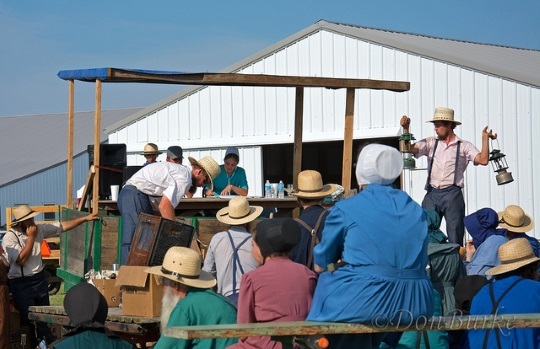 One of the most popular events is the July auction that the Amish are in charge of. It’s a 2-day auction that brings people from all over to Jamesport. I already have my whole inn booked for these dates and have most if it booked for 2019 already! They sell all kinds of things from antiques to horses. They have a lunch stand on the premises with food and drinks. The auction is held on the Wednesday and Thursday of the week of July 4th. It is a sight to see! What’s one thing people should be sure to do if they visit the Jamesport area? Marie: I always encourage people to drive out in the country to see the sights. Most people are afraid to go out too far as they are afraid of getting lost. I always encourage them to take a tour as that gives them a chance to see the countryside! Thanks to Marie for her interesting answers. 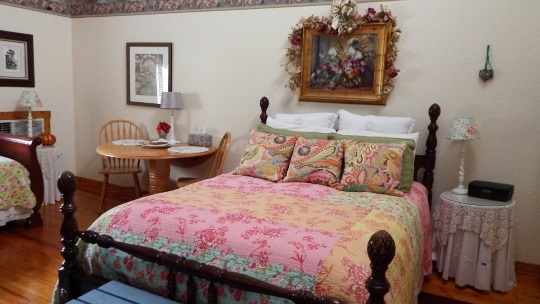 If you’d like to visit Jamesport, you could try staying at Marie’s Arbor House Country Inn. Marie was so kind and welcoming. The cinnamon rolls and coffee were delicious! We stayed in the Hunter room. The hand made wood furniture was beautiful! The town was quiet and very welcoming. Depot BBQ was very good and the owners were so nice. We will be back! Marie, the innkeeper, is a joy. I wish we had more time to get to know her. We’ve got a few photos below. 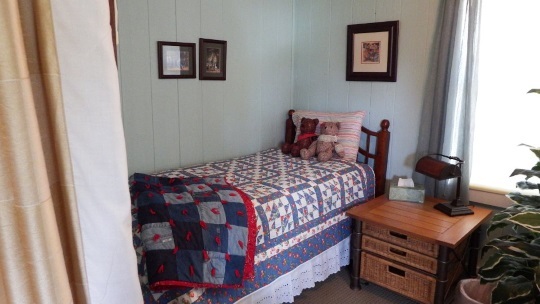 You can also find out more and browse rooms at her site jamesport.net. My husband and I stayed at Arbor House and met Marie. 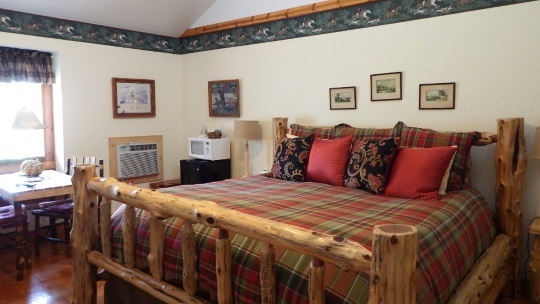 It’s a beautiful place and not only are the rooms pretty and comfortable, but the outdoor space is too!! It’s a great place to go and learn and just relax, we love it. We also went to her mom’s house a couple times and she showed us around. My husband and I say it’s a more “joyful” Amish community than some others we’ve been to, the people are super friendly. The “teens” are a lot more modern than most would realize, I think. I have some great pics from there! What a fun post, now I want to go back. Hey I remember you! You guys should definitely come see me again!! I would love that! Hi Marie! We’ll be back for sure! 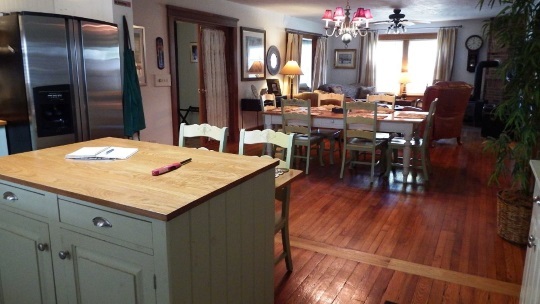 This past summer was our 30th anniversary and instead of going anywhere we redid our kitchen. LOL Keep up the great work and see you this summer! I’ve been going to Jamesport for 5 years now, and have always stayed at the Arbor House Country Inn, and never had a bad experience there. Marie is sweet and a wonderful host. There are a lot of great things to see in the area. It is a great place to visit. I want to stay there the next time I am “up home”. I grew up about 6 miles from Jamesport and remember when the Amish came to the area. I went to a one-room country school that closed the year they began to arrive. That school building was purchased, moved and became the first Amish school. I LOVE coming “home”. I’ve eaten at Gingrich’s several times. And H&M is my FAVORITE store. Love going into the Fabric “barn” that is there as well. Delighted to see this post. There are no Amish settlements close to where I live now.